For the next 48 hours, there’s nothing more important than the Brexit vote. Members of Parliament will begin voting on Prime Minister May’s withdrawal agreement at 7pm London time on Tuesday. There is no specific time for the vote to end, but it should happen in the late North American or early Asia session. At this point, May is expected to lose by a margin big enough to force her to seek an Article 50 extension. She’ll be giving a speech later today but don’t expect anything meaningful as this is nothing more than a last ditch effort to get members of Parliament to support her deal. Scenario #1 May WINS – The first scenario is the most straight forward. Even though sterling hit an almost 2 month high ahead of the vote, if Parliament approves Prime Minister May’s Brexit withdrawal agreement, GBP/USD will soar. We’ll see 1.31 quickly with GBP/USD making a move to 1.35 easily. EUR/GBP will drop immediately to 87 cents and eventually find its way down to 85 cents. Considering that she is all but certain to lose the vote, an unexpected victory would trigger a sharp and aggressive short squeeze in GBP. Scenario #2 May LOSES by narrow margin – The Commons consists of 650 members of parliament. Prime Minister may needs 318 of these MPs to support her bill for it to pass (there are a number voters who do not vote or are not counted). If her vote loses by 50 or less votes, she’ll may consider this a victory and release a statement quickly about going back to the EU for concessions on the backstop. If the margin of loss is small, the recent rally in GBP could continue as it would suggest that the PM has enough support within the government to try again. In this scenario, GBP/USD could extend its gains to 1.30 but probably not more beyond that. EUR/GBP would drop to 88, possibly 87 cents. Scenario #3 May LOSES by 100+ votes – The third scenario is where things get tricky. Losing by 100 or more votes is a major defeat but there’s some talk that she could lose by 200 votes. Either way, PM May has one choice to make immediately – extend Article 50 or declare defeat and force the UK out of the EU with no deal. The sensible option is to extend Article 50 so we hope that’s the announcement that she will make shortly after her loss. However we can never handicap the stubbornness of politicians so regardless of what the next step is, a major loss will lead to a knee jerk decline in GBP that could take GBP/USD below 1.25 and EUR/GBP above 91 cents. If May announces a no deal Brexit, the GBP could fall as much as 10%. 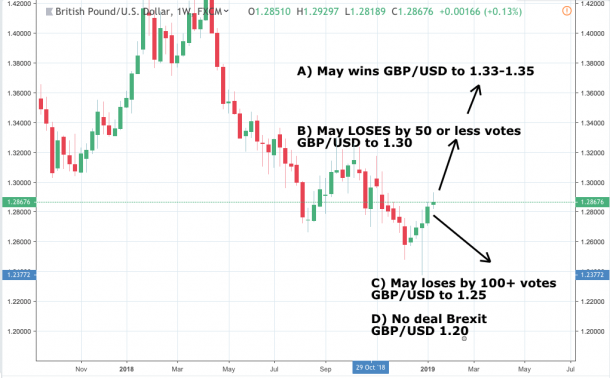 An immediate or delayed recovery in GBP would depend on how quickly Plan B emerges and how aggressively the opposition pushes for a general election or second referendum. If MPs push for a different type of Brexit deal with the EU, the decision to move forward with leaving the European Union would remove the uncertainty of a second referendum. 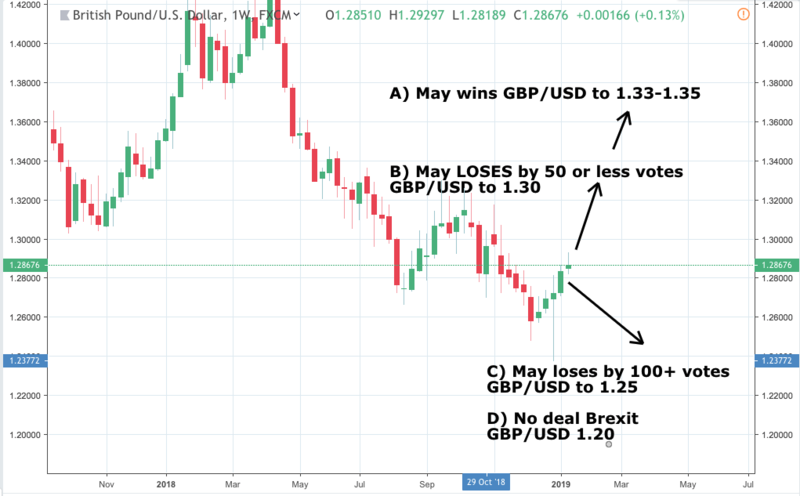 Its not clear which path UK lawmakers will take so even if GBP has an immediate recovery after a big loss for May, until a second referendum, (the preferred option for UK businesses) is announced, GBP is a sell and not a buy on rallies.